Meet a speech therapist whose work with adults keeps the conversation going! 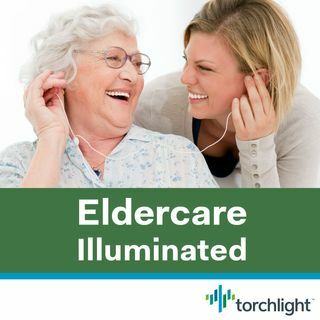 In this episode, Eldercare Illuminated host, Lenore Tracey, meets with a speech and language pathologist. These professionals work with individuals whose medical issues have impaired their ability to speak or understand. They also work with patients who have difficulty swallowing due to a stroke, surgery, or other condition, such as Alzheimer’s disease. Listen now to find out why these capacities can become impaired, ... Más informaciones about the various solutions that can help, and how patients and their families can move forward. Julia Haffer is a Clinical Speech and Language Pathologist, trained at the University of North Carolina at Chapel Hill. She works primarily with adult patients in hospitals and rehabilitation facilities on a wide variety of speech, language, and swallowing issues. Originally considering a speech pathology career with children, Julia found that working with adults was a challenging and rewarding opportunity, to which she quickly became committed.